Want to cuddle with Mary S? The most meaningful thing in the world is connection between people. There is nothing I like better than to look someone in the eye and have a real conversation. If we both enjoy cuddling with each other while having that conversation, then it is even better. I believe in the Buddhist philosophies of mindfulness and striving to be present in the moment. I find that offering my full presence to another person is the best way to stay in the moment. 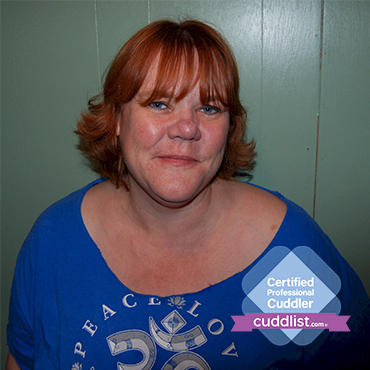 I feel very strongly that what I promote as a Cuddle Party Facilitator is an important message and ideology that so many people need to hear and experience in order to improve their lives and their frame of mind. 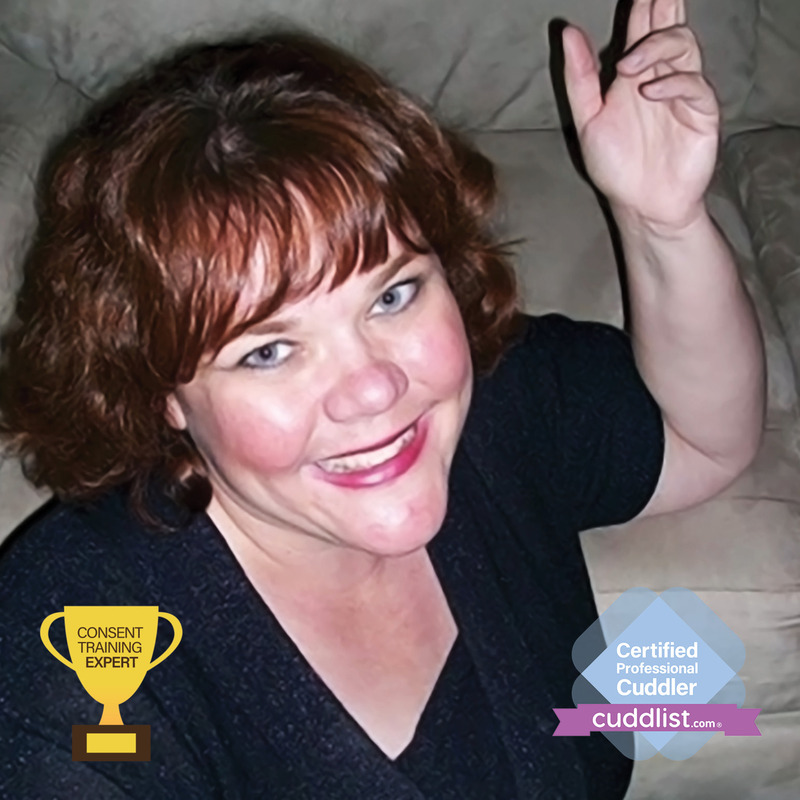 The communication and consent ideas from Cuddle Party are something that I would like to offer and promote one-on-one to you as well. I am passionate about spreading these ideas and also about helping people release shame and release assumptions and ideas which no longer serve them. In our American culture, ideas about boundaries and relationship behavior are very backwards. It is important to find people you can have open conversations with about appropriate boundaries and healthy relationship agreements. I can help you practice your communication skills, solidify your own ideas about what you want and what your boundaries are and give you some ideas on how to negotiate agreements with the people in your life. I am a good listener and I find that many people just need someone to listen and then give them a hug. I would love to do that for you. I offer a safe space to relax and be you without judgement. Touch is a basic need like sleep or food. You can get by on junk food or short yourself of sleep for a while, but your mood deteriorates and life is not good when you deprive yourself of sleep or healthy food over time. It is the same with meaningful, fulfilling touch. Private cuddling offers one avenue to receive that healthy touch and human connection that is so necessary to a full life. A friend of mine calls it Vitamin H(uman). I prescribe it for all of us. 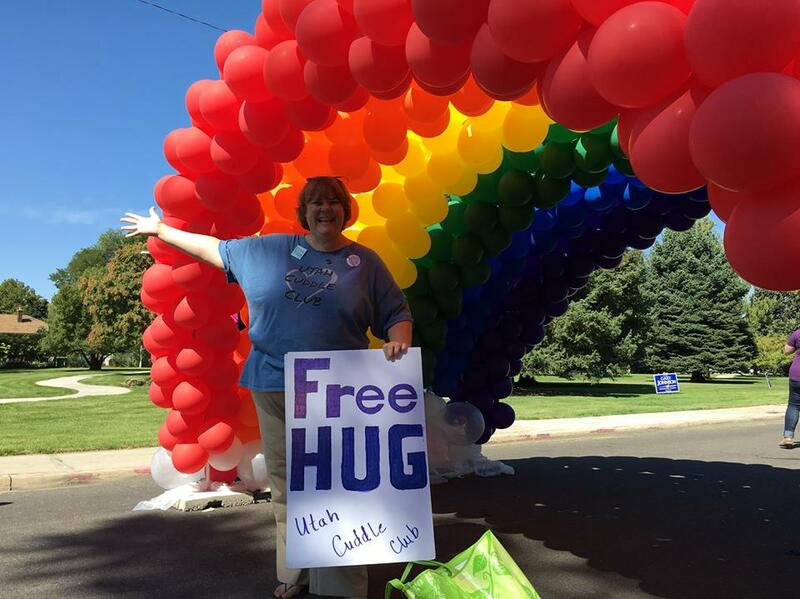 I was offering Free Hugs at the Utah Arts Festival and one woman came up to me, looked me in the eyes and paused. Then she said, “I WILL have a hug, you seem genuine.” Well, I AM genuine, I always try to be authentic (though this is a practice I am continually working on) and I did give her a hug and she went away smiling. I was smiling too. I love being genuine and authentic with people who give me the same respect of also being authentic. If we find we are not resonating with each other, in our authentic selves, that is fine – we can move on and find someone who IS attracted to our own individual light we show the world. My intake interview is free, so there is no down side to meeting me. I am pretty awesome in person. However, if you are still on the fence, I hope you will come to one of my Coffee Chats or a Cuddle Party so we can meet in a group setting and you can get a taste. 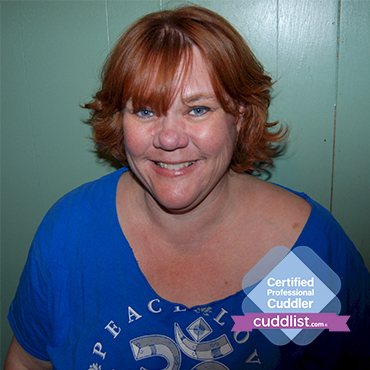 You can find my parties listed on Cuddle Party dot com or under Utah Cuddle Club (Salt Lake area) in Meetup. Communicate with me via EMAIL OR MESSAGING, not phone, to set up intake meeting. Setting up an intake meeting and a session usually takes a few days. Meet in a public place to chat and see if we want to book together. Schedule a session – pay expected in advance or at the beginning of the session. My process is a little different from other cuddlers. I prefer to communicate by email or messaging and to set up a face to face meeting as soon as possible to discuss working together. I have a day job and a personal life, so while I will usually respond within 24 hours, I mostly check my email weekday mornings. I am rarely available to meet or set up a session on that same day. This process may take a couple days. The intake meeting is free. We will meet in a public place like a coffee shop, the library or the park for a free intake interview for about 20-30 minutes. We will go over my agreement form, which I can email to you in advance. This will give us a chance to get to know each other and for you to ask all of your questions before we mutually decide if we want to book with each other. I can work with more than one person if you would like to bring a chaperone/observer, friend, partner or significant other. They must also be at the intake interview. When you fill out the session request sheet, keep in mind that you are requesting this new client intake interview, not an actual session. We will arrange our session after we speak in person and decide if booking together is right for us. I prefer to start with out-calls for new clients. We can cuddle at the movies, at the park, a space that you provide or decide to rent, at your place, at a coffee shop, in a hotel lobby, or wherever you feel comfortable. Whatever the client wants and I am comfortable sharing with them, within the code of conduct is allowed. Most probably, we will talk. I really love to discuss wellness, consent, relationships, boundaries and agreement negotiations. I can present several resources and I’ve done a lot of research on those subjects. I can offer you a reiki session, sing with you (or to you), play a game or teach you to knit/crochet while our shoulders touch. We can talk about whatever helps you to relax. I can offer several guided meditations or we may just decide to breathe together. Of course, I also offer healthy, consensual touch, which is something almost everyone needs and very few receive in a fulfilling way. For me, these sessions are about offering presence and connection with another human being, this is why I need to meet you in person before agreeing to book a session. Presence and healthy touch can facilitate relaxation and healing. I offer to hold safe space for you to be yourself and relax without judgement. I will be there for YOU; you get to decide how the session will go. I really enjoy offering personal coaching on communication consent and health and wellness topics. I am mostly self-taught in these fields so I cannot offer you any certifications or degrees. I have read numerous books attended seminars and workshops and done research on my own personal growth journey. I hope my knowledge will be valuable for you. I have lots of skills and diverse knowledge that I would be glad to offer you. I am an excellent listener. We can talk about anything you are thinking about invested in or worried about right now so that you can get it off your chest and relax. 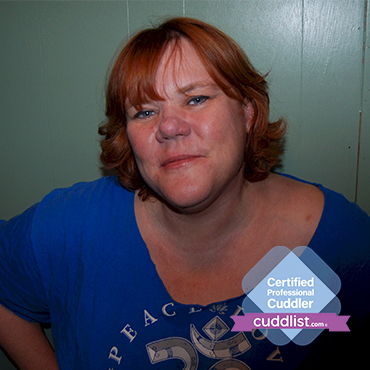 Cuddle Party Facilitator - I am a certified Cuddle Party Facilitator (#0099) and I have been hosting parties in Salt Lake since May 2015. Reiki Level 2 Certification - I would be glad to offer reiki to you in our session –either as part of the session or for the entire session. I have a lot of skills and diverse knowledge that I would be glad to offer to you. I can even teach you how to knit if we just want a distraction while sitting close to each other and sharing time. Evenings and weekends only. I have a day job, unfortunately.